Rolling down the dirt driveway into Branch Mill Organic Farm, I am instantly captivated by the sheer abundance of color. Fresh from recent rains and flush with spring possibility, the brushstrokes of Mother Earth are staggeringly beautiful. 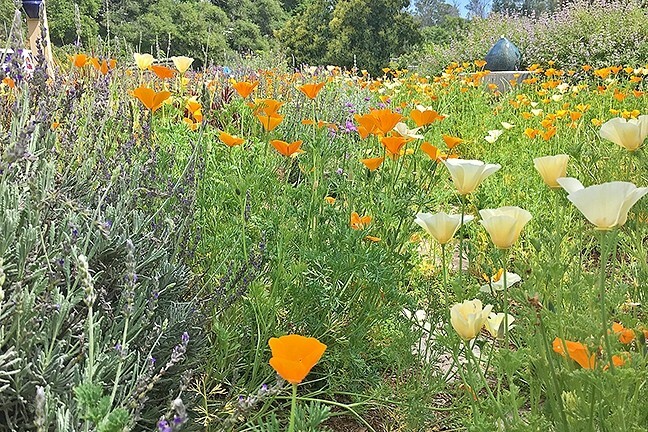 Bold poppies have taken over the entire entrance to the farmhouse, nestled within Arroyo Grande’s green and brown agricultural patchwork. We’re only a few miles from the downtown village, yet these flowers—a collection of golden and creamy petals—have transported me to an entirely different world. Tall sprays of lavender, a massive avocado tree, and a thriving permaculture forest greet visitors to this sacred space. There’s also owner/farmer/tour guide Ruth Madocks, who’s always working on some daily task: feeding a 22-chicken flock, inspecting the crops, turning compost. BIODYNAMIC BASH: Branch Mill Organic Farm will play host to a bevy of earthy delights on Saturday, April 15, benefitting the nonprofit’s mission to promote sustainable ag education. The fun includes yoga and dance workshops, arts and crafts, kids’ activities, food and wine vendors, live music, and tours of the farm’s thriving permaculture food forest, biodynamic crops, and vibrant greenhouse. Today, she and her loyal farm crew are hyper focused on weeding (as you may already know, rains bring poppies but also lots of vigorous overgrowth). After all, they’ve got guests coming. Earth Day is just around the corner. “Today’s a work day, so you’ll get to meet the whole gang,” she says, beckoning me into her flourishing domain. First, I have to take a quick tour of the farm’s yoga studio, which is clean and serene—a far cry from the dirt and straw outside. There, in the adjoining kitchen, is where Madocks makes the therapeutic tinctures, salves, candles, and sprays that locals love so dearly. I could write a whole story about these bottles alone, but that’s not what this article’s about. The heart of this tale lies in Branch Mill Organic Farm’s ability to bring different people together to celebrate this big blue ball we all call home. The gathering place has served as a welcoming destination for artists, traveling farmers, New Agers, and plain ol’ locals since 2010. What brings them here? They come to pick tomatoes, take healing yoga classes, commune with nature, perform full moon ceremonies, dine on farm-to-table dinners, and—each April 15—to celebrate Earth Day (which is on April 22) in a flurry of soul-nourishing rituals. This year’s event is expected to draw more than 500 people with a lineup of live local music, children’s activities, yoga and dance workshops, local food and craft vendors, beer, wine, raffles, and more. Madocks, a former ESL teacher for more than three decades, loves the educational aspect of bringing visitors to the certified organic 10-acre farm. Tours will be available throughout the event, which runs from 9 a.m. to 5 p.m.
Farm volunteer Karoline Hausted got involved with the land through Madocks’ full moon ceremonies, which unfold under the stars and around a crackling bonfire. The local musician plays in the band To Wake You, and she’s curated a lineup of fellow musicians to breathe sonic life into the Earth Day event. The greenhouse at Branch Mill Organic Farm. That smaller kids’ music stage will vibrate with commotion within the farm’s 6,000-square-foot green house, where edible flowers, squash blossoms, and sunflowers add to the au natural decor. On this day, I find thousands of starter plants and sprouts reaching toward the heavens. It’s warm and sunny in this manmade womb—a perfect place for kiddos to run free, bang on tambourines or take part in a communal mural. Back outside, our tour continues with even more luscious leafy things. The main market garden is in transition from winter to spring, featuring big tufts of garlic tendrils, carrots, potatoes, cabbage, cauliflower, broccoli, and more. Much of the produce goes to the SLO Natural Foods Co-Op, although restaurants love to use the produce, too. Over the winter, the farm produced 15,000 pounds of winter squash and pumpkins. Madocks takes me inside a cool storage room, where the last of that precious crop is stowed away. She holds out the veggies as if they were gold. During the Earth Day event on April 15, visitors can chow down on farm-fresh salads grown right here in this soil. Looking around, the plants look healthy and—well—delicious. That’s in large part thanks to Timothy Hollingsworth, who considers the physical, chemical, magnetic, electrical, biodynamic, and homeopathic nature of plants. He’s here to spray his proprietary blend of Green Gold Naturals organic plant accelerator in preparation for the upcoming shindig. Hollingsworth uses the spray in tandem with the moon cycles (an ancient practice) to work with—not against—Mother Nature. 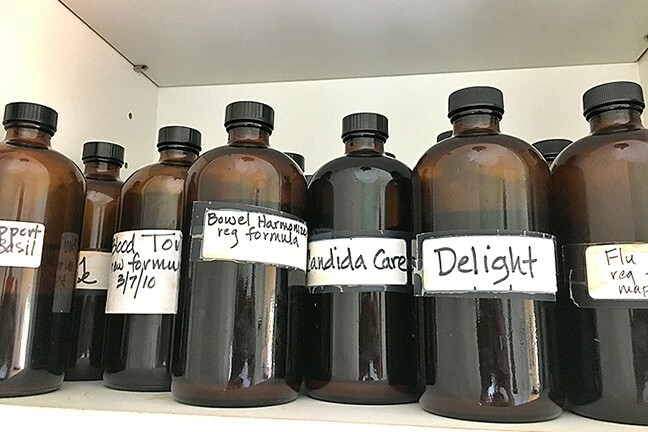 Herbal tinctures by Branch Mill Organic Farm's owner/farmer/tour guide Ruth Madocks in progress. Cherri Rodriguez, whose title is solely to “give love to the garden,” knows this magic works well. Barefoot and suntanned, she’s crouched over a raised planter bed marveling over a patch of unexpected spinach thriving just under the overgrown arugula. Sometimes nature has a way of surprising us all. She and her partner, Frank Fernandez, had been working on communal farms for years when they settled at Branch Mill. Frank is a character full of knowledge. He shows me the farm’s food forest, a major point of pride. “Permaculture is about letting nature take its course, while working with certain plants that will work well in the environment,” Fernandez says. He shows me the man-made swale that encourages rain water to collect in its gutter (massive tanks are also used to collect this precious resource). 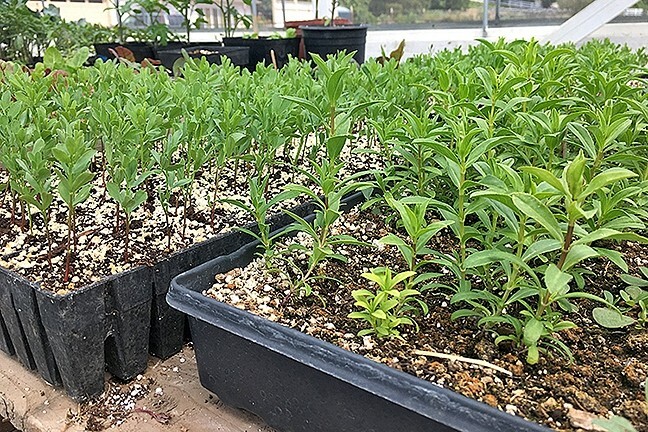 At first glance, the farm’s 4 acres of food forest looks like a collection of random fruit trees, veggies, and flowers, but Fernandez knows better. Beans are allowed to grow wild and are then tucked back into the earth to give a boost of nitrogen; garlic chives are planted next to strawberries to keep pests at bay; neon orange edible calendula also warns off bad bugs, while attracting the good. It is this interconnected web that we—as humans—can learn from on Earth Day. BRANCH OFF: On Saturday, April 15, from 9 a.m. to 5 p.m., Branch Mill Organic Farm and Retreat Center in Arroyo Grande will be transformed into a natural wonderland with music by Zen Mountain Poets, To Wake You, Bear Market Riot, Organic Family Tree, Robin Liepman, and more. Farm tours, beer and wine, yoga, solar powered wagon demonstration, food vendors, workshops, arts and crafts, a raffle, and kid’s activities will be on hand. Tickets are $5 (children are free). Funds go back to the Branch Mill Organics nonprofit. The farm is located at 2815 Branch Mill Road in Arroyo Grande. For information and directions to the farm, go to branchmillorganics.com. But this beloved Earth Day event almost never happened. That mission statement is threefold: to show the public where healthy, sustainable food comes from; to provide a retreat center to enhance personal growth; and to offer volunteer opportunities that foster a sense of community. These are the invisible seeds that are growing at branch Mill Organic Farm. Hayley Thomas Cain is stoked for Earth Day and is currently savoring the last of winter’s butternut squash, courtesy of Branch Mill Organic Farm. She can be reached at hthomas@newtimesslo.com.